We have just started the second quarter of the year 2019, and we all know what that means, right? School’s out, graduation ceremonies and parties have just ended, and summer has finally arrived! For students, they have long since awaited this two-month break to finally get a breather from stressful assignments and projects. Unfortunately, for us working professionals, we aren’t so lucky to get those two months off. However, don’t keep that from stopping you to grab that leave form and apply for that well-deserved summer vacation. After all, you deserve to take time away from your hectic and busy lifestyle, or else you might not be that far off from that terrifying thing called burnout. Blue water, white sand, the mountains—summer is definitely the perfect time to get away from the very active and frenzied city atmosphere and enjoy a relaxing yet fun getaway with family, friends, and a loved one. Whatever your type of holiday is, for most of us, this kind of activity also means preparing our cars for a very long drive. Now, a car drive doesn’t necessarily have to be boring and uncomfortable. Most road trips can be quite exciting and enjoyable if we make it to be, especially if we’re with people whose company we enjoy. What can make it even more memorable is the type of vehicle we’re in. Whether you are going to another city, to the beach, or just want to spend a day or two on the road, we cannot deny that a car that can suit the demands of a road trip is crucial for it to be a fun and comfortable experience. In this article, let’s talk about the different models pointing to why Nissan can be your best choice when it comes to road trips. One important criteria for a car to be perfect for road trips, especially with a large group, is a roomy and spacious interior, and you’d have a difficult time trying to find a better one than this compact SUV. It boasts a generous space you can use for cargo while still making it possible for you to stretch out your legs during very long distances. The 2018 updated version also makes room for five passengers and an extra headspace for your tall friends, while both the front and back seats providing you high-quality comfort. If you want to pick a vehicle perfect for achieving those highway miles, the Altima is your best bet. Despite its large size, it doesn’t affect the car’s fuel efficiency and even features reactive transmission and acceleration. With these, a gallon of fuel can get you to 26 to 31 miles if you’re to go on highways, perfect for those long drives out of the city. What’s even better is with the recent version’s fatigue-free technology equipped on the two front seats, it makes sure the driver and front-seat passenger stay awake and alert during this long-distance driving. Nissan made headlines in 2011 when they first released their first all-electric model, winning major awards for green automobiles and achieving the title of best-selling electric car in history. Although it seems doubtful, the new 2018 Leaf came out with various upgrades, making it possible to be used for a weekend trip of a few hundred miles. As long as you make sure to charge it once you arrive at your destination, the Leaf is capable of taking you up to 250 miles; perfect if you want a short trip just within the city and to explore local spots. With significant updates on its comfort, performance, and technology, you won’t regret taking this beauty out for a ride. If you’re going on a trip with a larger group of more than six people, then it’s time to take this spacious minivan out. This vehicle offers a convenient ride with its easy to rearrange and adjust seating formation and a DVD entertainment system that you can choose to use if you get bored during lengthy rides. If the entertainment system is not your type, then the ability of the captain’s chairs to be reclined is ideal for you to take that quick nap. In conclusion, this multinational automobile manufacturer certainly has a diverse enough array of offerings to ensure your holiday trips go without a hitch. Basically, preparing for a trip requires of you to be able to decide what kind of trip you would like to be in, making Nissan vehicles perfect for you. Whether you’re going on a trip with your family and kids, or with your friends, stop by your nearest Nissan branch and choose your favorite road trip car now. As 2018 draws to a close we have a lot in store for us in 2019, and we look forward to them with anticipation. One of the things people are looking forward to are the newest batch of their favorite cars. Even though not every single auto gets a revamp, people still anticipate this every year. And why shouldn’t they? With a new version comes brand-new features that will further enhance the overall experience dedicated drivers and passengers experience. Aside from everything under the hood though, newer variants will likely receive an upgrade in the aesthetics department as well. Nissan has a good track record when it comes to new variant reveals, as they are known to not only enhance almost everything under the hood, but they make sure their customers won’t be disappointed with how the vehicles look either. For 2019, Nissan has yet again proven they are worth the people’s regard. There are a lot of improvements that have been happening, and some of the old features we know and love are still here to stay. Although we won‘t be able to cover every single detail of each car, we’ve laid down some of the updates regarding Nissan’s lineup for 2019. Five years after its last update, Nissan’s best-selling sedan is now getting a welcome upgrade. 2019 is going to feature the sixth-generation Nissan Altima, and it is definitely something loyal customers and fans should look out for. On the outside, the changes are already quite evident as the new Altima now has a sporty, more aggressive look, if you will. It is longer, lower, and wider than the fifth-gen, and also has a ProPilot Assist cruise control added on top of its electronic safety features. It’s also said to have an all-wheel drive-capable variant, which is something that is rarely seen in sedans. Its 2-liter unit engine also offers outstanding fuel-efficiency, a core consideration of Nissan’s engineers when they designed the vehicle. Sleek on the outside, and strong on the inside, the 2019 Altima is something enthusiasts will want to have. Among all cars except the pickup trucks, the Nissan Rogue was the second best-selling vehicle in the US in 2017. This is a great jump from the previous year’s performance, and the next generation only serves to enhance the already impressive gamut of features the Rogue offers. Riding the wave of the crossover craze, the Rogue is expected to continue its impressive performance, as the newest model also features the ProPilot Assist, as well as various other convenience and safety gear. Aside from the electronic features, it also has an enhanced engine with greater fuel efficiency than ever. Despite fierce competition in the space, the Nissan Rogue still continues to perform well due to its combination of comparable affordability and impressive host of features that allow drivers to go where they want in style. Being just as anticipated as this year, the 2019 version of the Nissan Terra is expected to launch within the first three months of the year. This has yet to be confirmed though, so keep your ears on the ground for more updates. Going with the trend of rugged and aggressive, yet elegant and stylish, the 2019 Terra showcases all of the hard work the company has put into this model. Its new 2.3L v6 engine packs a lot of power, and it has the capability to generate up to 233 pounds-feet in torque. Compared to other vehicles in its category, the Nissan Terra is actually quite fuel-friendly. It is said that if you were to drive within the city, you should get around 29km per gallon. Take it to the highway, however, and you’ll squeeze out around almost 40km per gallon. When you look at the 2019 Navara from the outside, the first thing you’ll notice is how it doesn’t look that much different from the previous variant. Despite it looking the same, that couldn’t be farther from the truth when we head inside. With its upgraded dual-rate progressive rear coil spring, as well as the improved steering system, the driving experience will be totally different from what most are used to. Even on loose surfaces, the control the driver gets from the car is on a different class entirely. The aforementioned new coil springs will be delivering more stability and comfort for those inside, and even when the truck bed is filled, the suspension dip is better than before. All in all, customers should expect a smoother, controlled experience whether you’re up front or in the back. Here in the Philippines, the mid-sized SUV battle has always been a tightly one. A lot of major manufacturers have placed their bets, and as of now, there has been no clear-cut winner. Every year, car companies bring out new versions of their prized SUVs, and they never fail to impress. With newer technology going into the creation of these beauties, and more features aimed at enhancing the rider’s experience, one can always expect that the new SUVs coming up will definitely be a good match for anyone who likes to ride in style. Nissan is no different, as just this year the Japanese company has released their own contender for the mid-sized SUV crown: the Nissan Terra. Originally sold in China by Dongfeng Nissan and Zhengzhou Nissan, the Nissan Terra was launched in the Philippines last May. Compared to the Chinese version of the vehicle, the Philippine Nissan Terra is slightly wider and longer, and also seats more passengers. Developed from the Nissan Navara NP300, the Terra sports a look similar to that of the Nissan Terrano. The car has been much-anticipated since October of last year, when car enthusiast circles were bombarded with the announcement that a Navara-based SUV was to arrive. 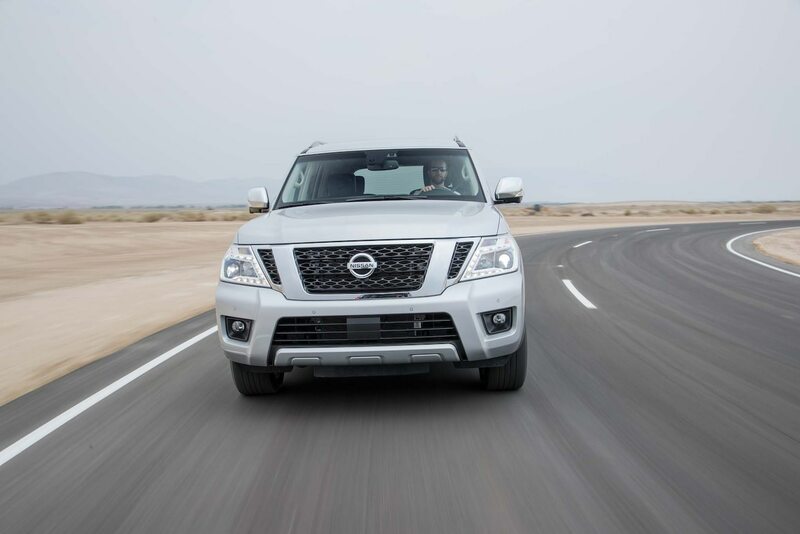 Looking at the Nissan Terra up front, it definitely looks the part of a powerful SUV. It has this muscular look due to its Nissan signature V-shaped chrome grille, as well as sharply designed headlights that also have LED daytime running lamps. Another feature that you can see from looking at it face to face is the large air intake and the huge front bumper. To its side, the Terra has 18-inch alloy wheels, as well as flared fenders and chrome-finished door handles. It also has a moderately high ground clearance of 220mm, which is clearly visible because of the high sitting stance. At the back, it features a unique set of tail lights that are combined with a chrome trim. Going inside the Nissan Terra, one will immediately notice that the interior closely resembles that of the Nissan Navara. It has a sloping dashboard and a V-shaped steering wheel, and higher variants also feature automatic climate control system and rear air vents. When it comes to space, the Nissan Terra is capable of seating up to seven passengers in three rows. Mounting and dismounting for those on the third row is less of a hassle now due to the vehicle’s automatic tumble function, wherein a simple push of a button on the dashboard will allow passengers on the third row to easily move in or get out. The Terra also has Nissan’s Intelligent Mobility Features, and is loaded with an intelligent rear view mirror, rear cross traffic alert, lane departure warning, hill-descent control, and more. Because the Nissan Terra will have the same body-on-frame chassis design as the Navara, the vehicle will have the same 4×4, and powerful off-road capability similar to that of the Navara. As opposed to the 2.5L QR25 gas engine in the Chinese model, the ASEAN market Terra features a 2.5L YD25DDTi turbo-diesel engine, again, like that of the Navara. This robust engine can give out 187 horse power and 450 Nm of torque, working together with either a six-speed manual, or seven-speed automatic transmission. Despite the big numbers that the Nissan Terra is able to deliver power-wise, those inside are still guaranteed a comfortable ride as Nissan prioritized passenger comfort. The mid-sized SUV market has just gotten a lot more competitive with Nissan’s brand new contender. The Terra is the perfect choice for those who love the power and comfort that the Nissan Navara provides, but prefer SUVs over pick-up trucks. The Nissan Terra will go head to head with the vehicles from other manufacturers, particularly the Toyota Fortuner, Ford Everest, Mitsubishi Montero Sport, Isuzu MU-X, and more. Only time will tell which one will come out on top though, and for now all we can do is enjoy the features and capabilities that these high-end SUVs give us. When we purchase our Nissan vehicle, it’s in an investment to ensure we travel both in style and comfort. We get our cars with the thought that for the next years we wouldn’t have to worry about using public transportation when going from point “A” to point “B” anymore. However, we also bear in mind that though these vehicles were built to last, they will stop running eventually. Nonetheless, there are things we can do to extend our Nissan vehicle’s mileage as long as possible before having to replace parts, or if need be, purchase another vehicle altogether. For the most part, a lot of drivers don’t really think too much about the engine. The only time we usually think about what is happening under the hood is when we notice it’s making a sound it shouldn’t be making, or when we feel there’s something different when we drive. Aside from regular check-ups, there are other things drivers can do in order to keep their engine running at top form. Changing the oil regularly is probably the most important one. Oil keeps the engine well lubricated so the parts run smoothly and won’t overheat. It’s also good to make sure the cooling system is working to prevent overheating as well. Some drivers don’t pay attention whenever an automotive warning light flashes near the speedometer, but it would be best to follow-up on this as soon as possible. Lastly, something as simple as going easy when stopping and starting the car can go a long way in making sure the engine is kept in good condition. Our vehicles take a beating from the elements day in and day out, so making sure it looks spick and span is sometimes not as easy as we’d like. For the exterior, there are three easy steps: wash, dry, and wax. First, wash the exterior with water and if needed, mix in a bit of car shampoo. After rinsing, let it drip dry before wiping the vehicle using chamois or a towel. Then apply wax as an extra layer of protection against dirt and dust. For the interior, the first step would be to declutter the car. Remove items like empty water bottles, wet tissue dispensers, magazines and trash. Next, clean the console using any household cleaner. Proceed to clean the windows. Use another rag soaked with window cleaner to wipe any dust or dirt from the inside, and then wipe down the inside windows with another dry rag. For the seats and upholstery, use a cleaning solution. For the floor, use a vacuum. After all that, one should air out the car for a few minutes by leaving the doors open. As many drivers know, transmission problems are usually pricey to fix depending on the extent of the damage. Therefore, to avoid breaking the bank to pay for mechanic fees, there are a couple of things car owners can do. Checking the transmission fluid is one of these, and it should be done monthly. Next is letting the car warm up before heading out the garage. Something as simple as not warming up the car can cause problems down the road, especially during the colder times of the year. Another tip is to not overload the vehicle, and be cautious when switching gears. We all know that there are times that doing these two is unavoidable, but to reduce wear and tear, it would be best to keep this tip in mind. Finally, if you suspect something is wrong, immediately contact, or better yet, go to the closest Nissan service center to get it checked. Besides the tips we’ve laid out, there are a lot of other things drivers can do to ensure their car stays in top shape. Even the smallest thing can impact the overall condition of the vehicle, so it is always best to handle it with care at all times in order for your Nissan to be with you for many years to come. There are many factors to be considered when buying a new car for the family. Apart from listing down a specific model’s quality, performance, and features, the family also needs to balance preferences with their budget. In addition to the initial price they need to pay, they also need to consider the long-term ownership costs of the model they are going to choose. It’s also important to consider that family cars are used quite differently compared to other types of vehicles. A family car is expected to be a multifunctional vehicle. It’s definitely going to accumulate mileage given that it’s going to be used to drop off and pick up kids from school as well as in other sorts of activities. Oftentimes, it can also serve as a baby-changing facility, a place to sleep, or even as a makeshift dining room (if it’s large enough). With all that said, don’t let the idea of having a versatile vehicle lull you into being an undiscriminating buyer. Never forget safety should also be one of the most important parts of the equation. In fact, it should be the priority. Each family has different needs. In order to find the balance between functionality, performance, budget, and safety, there might be several things on your checklist you’ve to tick off. However, safety shouldn’t be one of the things the family chooses to forgo. Choosing the right SUV for the family doesn’t necessarily have to be an overwhelming affair though. Thankfully, many car manufacturers do understand the needs of the average family. If you’re thinking of getting one soon, you need to check out one of Nissan’s newest SUV models, the Armada. The 2018 Nissan Armada is perfect for families who are looking for a vehicle that will fit their cargo-carrying needs but are not so sure if they want to get bulky truck-like SUVs. Unlike, the previous model, the 2018 Armada doesn’t have a truck-based design. It’s more of an updated version of the Nissan Patrol SUV. Although that in itself sounds appealing, that’s not exactly the real reason why the 2018 Armada does well as a family SUV. Apart from its huge cargo bay, the Armada is also designed to feature a generous passenger space. It also provides better suspension damping than its 2003 predecessor. It’s also noticeably smoother and body motions are well controlled. Drivers will also find the vehicle easy to maneuver especially around parking lots (making it perfect for weekly trips to crowded malls) since its steering is lightly weighted and highly responsive. It also has a solid brake performance, which provides drivers with enough confidence while on the road. The vehicle is also quite agile considering its weight. Although it took a while for Nissan to produce the 6,000-pound second generation Armada, the changes that were made to it proved to be worth the wait. Apart from revamping its looks, the new Armada was also given a more comfortable interior. It was also given its fair share of technological upgrades that have made it comparable to other SUVs in the market such as the Ford Expedition, Chevrolet Tahoe, and the Toyota Sequoia. 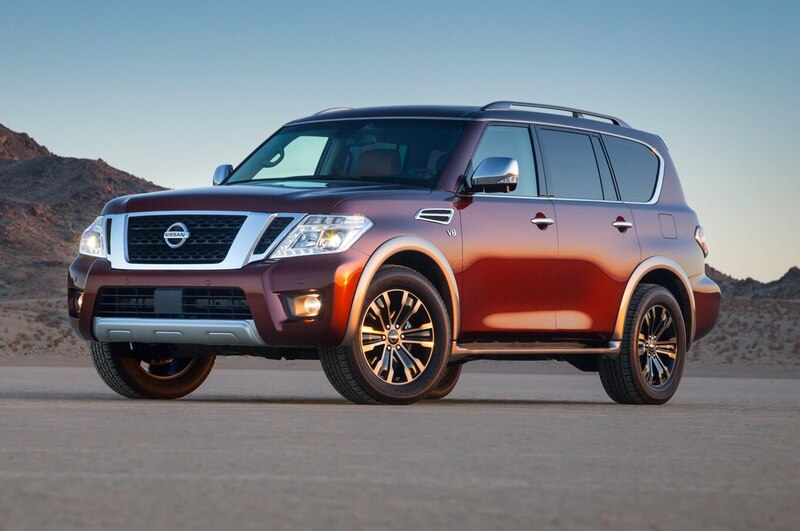 Fans of the Infiniti QX80 will notice the Armada’s resemblance to it. Both models feature the same exterior sheet metal that makes both vehicles appear very similar to each other from both the rear and the side. On the front however, the Armada is built with a blockier design that features Nissan’s trademark V-motion grille. Between both vehicles, the Nissan Armada provides consumers with a more affordable option. It’s ideal for a large or growing family for its luxurious and spacious interior. Besides that, it also boasts of a competent on-road performance that defeats other models in the market such as the Sequoia and the Tahoe. It also comes with a dual-screen entertainment system that’s perfect for trips with children. Finally, the Armada is powered by an impressive 5.6-liter V8 engine. Overall, the Armada is a great option for anyone who is looking for a large and spacious SUV. It’s a heavy and considerably large vehicle but it’s also agile and easy to maneuver. The new Nissan X-Trail is the best looking version of itself yet. Nissan has gotten rid of its old boxy design to adapt a more stylish, sleek body. It comes with a wider V-shaped grille and features daytime running lamps for a more comfortable driving and visual experience. The automatic dual zone climate control in particular is something most Filipinos will appreciate, as it can come in handy in our hot, tropical climate. For off-road traveling, the 4×4-I System instantly distributes power to all four wheels, and to improve your safety on the road, the Blind Spot Warning and Rear Cross Traffic Alert features will help you avoid scrapes and fender benders. While the original X-Trail was launched in 2001, it’s still a major player in the crossover segment, especially now with all these cool additions. Other cruise control features are Intelligent Emergency Braking and Forward Collision Warning. Many of the upgrades in the X-Trail are geared towards family adventures as well as driving in the big city. ProPilot is a cruise control system designed for stop-and-go traffic. It helps your car stay in your lane as you go into a curve. The system lets the X-trail understand traffic conditions through an advanced image processing technology so heavy traffic becomes less stressful. The X-Trail is Nissan’s second car to have integrated ProPilot. The changes in the new X-Trail include an interior redesign as well. The seats allow optimum comfort, and the passenger seat and second row seats can be reclined to allow more leg room and cargo. Tall drivers will certainly love the high roofline. What’s more impressive is the optional third row of seats. For additional space, you can use the optional 50/50 split folding third row for more cargo space or for driving your whole family around. The steering wheel also feels nicer than that of the X-Trail’s predecessors, and you can just feel the whole interior is filled with quality materials. It’s worth noting there’s a good amount of storage space in the front, which includes a large glove box. The dashboard is ergonomically designed so buttons are easy to reach. The buttons and switches are also easy to operate so you can drive with precision. As mentioned above, the crossover’s tech sharpens its responses to surrounding vehicles, bumps, and corners, making it one of the best in its class in terms of off-road driving, family fun, or even heading out to the nearest convenience store. While it’s a big SUV, the front and rear sensors will help you steer and park with ease. The 4WD is usually not necessary if your daily drive doesn’t require rough roads. That’s why having the choice of two- and four-wheel drives is quite convenient. In fact, with its power and by installing reliable tires, the 2WD mode can still serve you well when getting up steep slopes. You can choose from three engines—one petrol and two diesels. Consider the 1.6 petrol if you usually don’t carry heavy loads. While engine noise is noticeable, it’s quieter than many of the X-Trail’s rivals, and mechanical vibration is kept at a minimum. On the other hand, it’s also a utility vehicle crafted specifically for rough terrain, so the two diesels fit perfect for this type of car. Along with all the road safety technology, the X-Trail is also built with six airbags. Nissan has been scoring high in reliability surveys and all their automobiles are generally constructed to stand the test of time. The X-Trail is definitely a great family car and will serve you well as a cargo carrier and off-roader. Looks-wise, it doesn’t look like it will ever look out of style because its general appearance is the same as its 2014 version and it still looks cool and fabulous. The new X-Trail is a noteworthy improvement than its previous versions and it no longer looks strictly utilitarian. It’s not surprising at all that the X-Trail is one of the top selling SUVs of 2017. When the limited edition Nissan Juke N-Style first came out, it caught the attention of a lot of car enthusiasts. It immediately became the stand out on any car lot. Now, Nissan Philippines Inc. has made available a Juke N-Style that’s donning a new color in an effort to give an already standout car more pizzazz and a striking presence on the road. When the Juke N-Style was first introduced back in January, there were only two available colors, Black Obsidian adorned with yellow accents and Cosmic Blue paired with white accents. As if those colors didn’t demand enough attention on the road, the new iteration of the Juke N-Style dons the eye-catching Moroccan Gray with orange accent color combo. Just like the previous versions, this Juke N-Style is a thing of beauty. The Moroccan Gray and orange accents blend perfectly to the style and shape of the vehicle, highlighting its most precious assets. Just like a lady who knows exactly how to grab the attention of a gentleman across a crowded room. Much like the previously released limited edition Juke N-Style, this Moroccan Gray version perfectly highlights its most beautiful curves. The orange accents showcase a lot of its elegantly designed trimmings. Looking at the front of the car, your eyes are immediately drawn to its captivating face. The headlamps adorned with an orange trim, the fog lamps surrounded by LED rings, the shape and accents of the front bumper and grill—you can tell that the engineers and designers really put their best foot forward on this one. The view from the back is just as amazing, which reminds me a lot of that 1992 Sir Mix-A-Lot song “Baby Got Back,” if you know what I mean. The boldness of the overall design, the striking rear accents—what a view it must be getting stuck behind this car in the middle of a traffic jam! I know I’d rather be staring at that beautiful rear end than anything else when I’m stuck in traffic. The sleek design of the side doors, the stylized side mirrors, the highlighted door sills, and the accented door handle covers complete the perfect look the designers are trying to achieve. Not that the previous releases of the Juke N-Style had dull interior features, but this Moroccan Gray version really has massive appeal when it comes to aesthetics. The black, gray, and orange color combo really captures the persona the vehicle is trying to embody. When you’re driving in this thing, you’re driving in style. The bright orange center console is a step ahead in terms of visual interior enhancements. The orange accents around the interior AC and the speakers just add to its elegance. Most importantly, with all these amazing new features and enhancements, they never sacrifice the comfort that is inherent in the Juke N-Style. Comfort is truly at its core. Of course the Nissan Juke N-Style is not without its amazing core features, such as the Intelligent Key that lets you tap a button on the door handle to unlock the car, while your key is safely tucked in your pocket or your purse. The cool-as-ever push button ignition that allows you to imagine you’re Sebastian Vettel in a Formula One car. With this amazing feature, you can just enter the vehicle, start the engine by pushing the button, and go without even taking out your key. Apart from riding in style, the Juke N-Style also features the I-Con system, which enables you to control the interior climate of the car and the driving mode with just a press of a button. You can switch from D-Mode to Climate Mode quicker than switching TV channels. The Nissan brand is known for the extra precautions they put into the engineering and development of their vehicles. The Nissan Safety Shield is a philosophy that emphasizes on a comprehensive approach to driving safety. From the systematic placement of the consoles to minimize distractions while you’re driving, to the sophistication they put into the design and engineering of the air bag and safety belt systems, you can be certain that when you’re driving a Nissan, you are in a safe and secure environment. Don’t forget to like us on Facebook and follow us on Instagram to get exclusive updates on your feeds.